The easy way for you to raise more from donations and supporters. we’re able to help you. Got shops? Make money from your unsold and non-saleable vintage donations with our hassle-free retail solution. No shops? Use our online service to raise money from your supporters vintage items, with no overhead costs. Take a look at all the types of items we accept. Here are some of our charity partners, with a few words to say about our service. Excellent company I’ve sent three boxes to them so far and haven’t been disappointed by the offer I received, all proceeds were in aid of The Midlands Air Ambulance Charity. As a small charity, we need to maximise every opportunity to raise funds and VCC seemed to be the perfect place to send unsold bric-a-brac. Really quick service and had a phone call within just 3 days of sending off the box and a cheque followed the day after. Would definitely recommend. We have years of experience turning old and vintage items into cash. Our service helps charities increase income, regardless of whether they have charity shops. On hand to advise about items we can or can’t accept. Ask them anything! They’ll book your free collections too. Track all income from specific donors, allowing you to claim Gift Aid from people who opt in. We have experts in every area to identifying and price items sent into us. Our expertise ensures you receive competitive prices for donated goods. Avoid valuables being missed or undervalued. No shops? No problem. 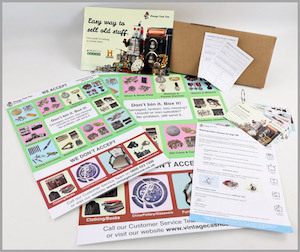 Your supporters can now send us their old and vintage items directly, for free. We cover all postage, handling, storage and selling costs as part of our service. This is the easiest and cheapest way for you to generate donations from peoples old items. Let’s talk about how we can help you. Contact us to find out more. Our dedicated team’s sole purpose is to help you make the most of working with us. With a wide range of experience from the 3rd sector and commercial, you can be assured that you’re in good hands. Garry’s role is to meet with charity representatives to share the Vintage Cash Cow for Charities service and secure mutually beneficial partnerships, helping them raise more income for their cause. Janine’s role is to lead and deliver the communications and marketing to support the charity sector in generating more income through new revenue streams. Carolynne's role is to support or advise charities about the items we accept and the service we provide to generate more funds. A2 and A3 poster – for your workroom(s) showing what we can and can't accept. Flash-cards – a quick guide to what we can and can’t accept. Brochure – giving you further information about us and the variety of the items we accept. Sender labels x 2 – attach to the outside of your box with your shop details to ensure we pay you correctly.